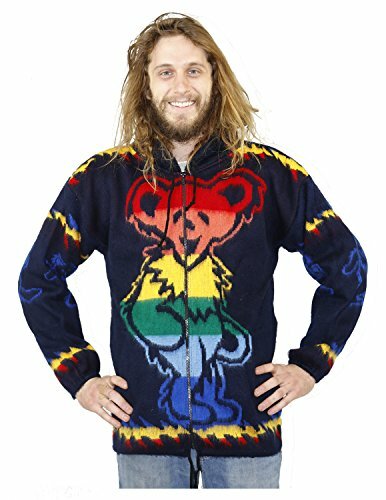 Grateful Dead Alpaca Style Zip Up Hooded Sweater Jacket Dancing Bears Navy Blue X-Large by Grateful Dead at W Jacket Outlet. Hurry! Limited time offer. Offer valid only while supplies last. Grateful Dead Alpaca Style Zip Up Hooded Sweater Dancing Bears Navy Blue. Size adult x-large. Officially licensed. Super soft and warm. 100% Acrylic. Grateful Dead Alpaca Style Zip Up Hooded Sweater Dancing Bears Navy Blue. Size adult x-large. Officially licensed. Super soft and warm. 100% Acrylic. Made in Mexico. Has two front pockets and drawstring hood and bottom. QUALITY: Sturdy zipper with Front pockets to keep your hands toasty. BOLD: Dancing Bear graphic on front and back and sleeves. ALPACA STYLE: Has the distinct soft, fuzzy fabric similar to an Alpaca sweater. If you have any questions about this product by Grateful Dead, contact us by completing and submitting the form below. If you are looking for a specif part number, please include it with your message.